DVI-I (designed to pass both digital and analog signals). Although the plug size and size is identical for each type, the number of pins varies with the requirements of each type. DVI is a common connection option in the PC landscape, but before HDMI was made available for home theater applications, DVI was used for transferring digital video signals from DVI-equipped source devices(such as from a DVI-equipped DVD player, cable or satellite box) directly to a video display (such as an HDTV, video monitor, or Video Projector) that also has a DVI input connection. In the home theater environment, if a DVI connection is used, it is most likely the DVI-D type. A DVI-equipped DVD player or other home theater source device can pass video signals with resolutions up to 1080p for display. 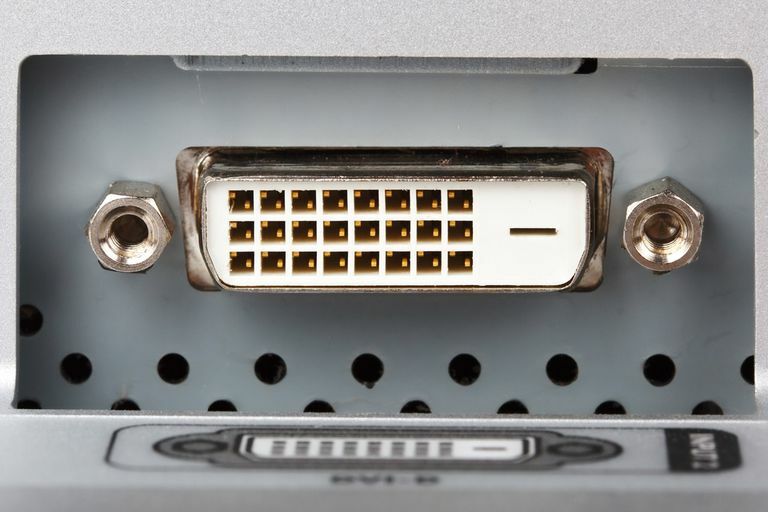 Using a DVI connection results in a better quality image from both standard and high definition video signals, than using Composite, S-Video, and may be equivalent to or better than Component Video connections. However, it is important to point out that since advent of HDMI as the default home theater connection standard for audio and video, you will no longer find DVI-connection options on modern HD and 4K Ultra HD TVs, but you may notice that one of the HDMI inputs is paired with a set of analog audio inputs for use when connecting a DVI source to the TV. You may still encounter cases in older DVD players and TVs where DVI is used instead of HDMI, or you may have an older TV that includes either DVI, or both DVI and HDMI connection options. It is important to note that unlike HDMI (which has the ability to pass both video and audio signals), DVI is designed to only pass Video signals. If using DVI to connect an AV source device to a TV, if you also desire audio, you must also make a separate audio connection to your TV - usually by using RCA or 3.5mmm Analog audio connections. The audio connections designated for pairing with the DVI input should be located next to the DVI input. Also, other things to take note of is that the DVI connection type used in a home theater environment may not pass 3D signals that use the standards in place for Blu-ray Disc and HDTVs, nor will it pass higher-resolution 4K video signals. However, DVI can pass resolutions up to 4K for certain PC applications, using a different pin configuration. Also, DVI connections cannot pass HDR or wide color gamut signals. In addition, if you have an older HDTV TV that does not have HDMI connection, but only DVI connection, but you need to connect HDMI source devices (such as a Blu-ray disc player, upscaling DVD player, or set-top box) to that TV, in many cases you can use an HDMI-to-DVI connection adapter. By the same token, if you have a DVD player or other source device that only has a DVI output and need to connect it to a TV that only has HDMI inputs, you can use the same type of HDMI-to-DVI adapter to make that connection. However, when using a DVI-to-HDMI adapter to connect a DVI source to an HDMI-equipped video display, or an HDMI source to a DVI-only TV, there is a catch. Due to the need for an HDMI-equipped video display device to be able to "handshake" with a source device (or vice versa), sometimes the display device will not recognize the source as legitimate (or vice versa), resulting in glitches (such as blank, snowy, or flashing picture). For some possible remedies, refer to our article: Troubleshooting HDMI Connections.